Jay Jensen, if that wood is that old you should do the two light coats wet on wet. TomS, use the Gemini Restore Kit and the TWP 100 or 1500 for your deck. hello I have a deck apx 15 years old. Went a few years past when it should have been refinished. Power washed it though and it looks good. I will need to sand though a bit. my question is how will i know for sure if two coats will be required ? I have a deck 8'x16'. Its pressure treated lumber. Never been stained. Approx. 10+ yrs.old. Its aged and weathered, coarse, has mold. What can you recommend to clean, brighten, and protect? I've been looking at your TWP100. NewDeckOwner, use the Gemini Restore Kit witht he pressure washing. Let wood dry 48 hours after prepping or heavy rain. 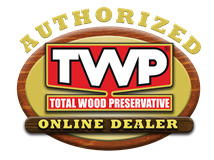 Make sure the TWP penetrates into the wood and does not dry on top of the wood. Our deck was installed in April 2012. It began to curl, warp and shrink by August 2012. Our carpenter told us that this meant it was time to seal/stain it. Unfortunately, we did not have enough good weather to finish the entire deck before wet and winter weather. However, the areas that we did seal last year are already peeling - the cedar benches and the treated steps. We live in Michigan and it gets full sun most of the day (faces east). We powerwashed it first, let it dry for a day and then applied two coats by brush, waiting about 15 - 30 min in between coats. Any advice to keep the stain from peeling now that we are preparin gto coat the rest of the deck? Also, how dry does the deck need to be after a rain/powerwash to begin staining (can we stain when it rained the prior night)? Lenny, either the 100 or 1500 will work. Hi I have just built with new dried wood a 12' x 10' cedar pergola and what to know when is should seal it and with which of your products to use. I have just stripped and sanded an old redwood deck. Deck was about 20yrs od and was previously painted. Do i need to clean/brighten the deck after sanding again. After sanding, the deck has a beautiful red/pink colour to the wood, but this doesnt last too long once exposed. Can i stain the deck after sanding or do i need to wait and then clean the deck before staining. Also i want to preserve the redwood color as much as possible without darkening too much. What color stain would you recommend. i was originally planning to use a clear stain, but the twp only seems to come in a color range. We have a new cedar deck 320 sq.ft. installed last week. would like to use TWP 100 Honeytone. Prep first with the Gemini Restore Kit. Only apply 1 coat of the TWP the first time staining. Prep with a cleaner and wood brightener with a light pressure washing. Lightly sand to remove any splinters. Stain with the TWP. It covers about 100-125 sq. feet for 2 coats per gallon. 3 years old never treated with any product. We have a new deck, pressure treated fir that is still being installed. Which TWP product do you recommend, as we live in Washington state and have cold winters with snow, but not a lot of rain. Half of the deck is under a roof, and half is exposed to the elements. Thank you! Opened is 6-12 months. If you reseal in a 100% closed container you can get maybe a year or two. I have a 5 gallon bucket of TWP 100 that is half full. How long does the stain stay good in the can?